Downloadable Press Release and Photos for Media Use click here. 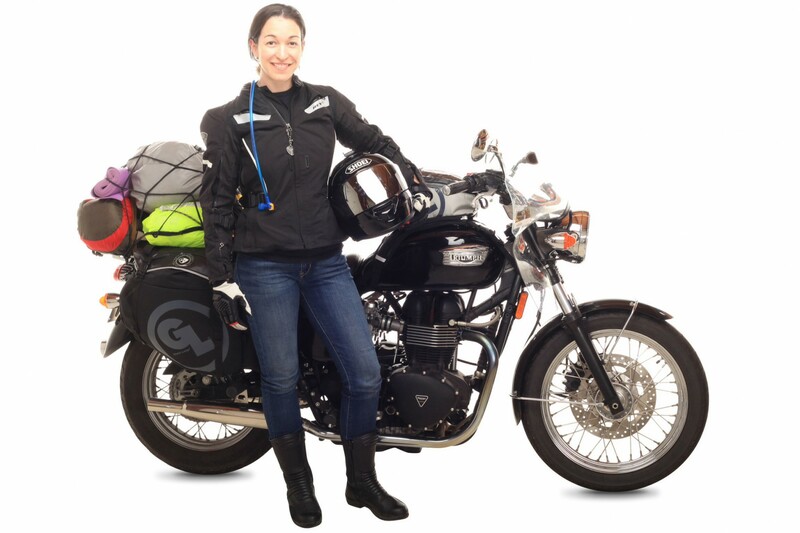 Solo Motorcycle adventure of one woman on a Triumph Bonneville to all 50 states and Canada. While going through the lower 48 she has been accepted by Guinness Book of World Records for an attempt to break the current WR for – ’Longest journey by motorcycle in a single country’, add to that donations to schools in every state classroom copies of her new book Philanthropic Wanderlust – Young Readers Edition (book releases in Aug), and filming a web-series of the adventure. Starting with a departure in Arizona Sept. 19th and heading west to California where she is a selected presenter at the Horizons Unlimited event happening in Yosemite and an official send-off launch on site at the event. “I wanted to plan an adventure that would open many ideas for me as a writer, humanitarian and traveler. Some of the ideas that I will be working with / on is providing hand knitted hats to the homeless around the nation and documenting their stories through photographs and videos while on the road “Street Stories.” My hope is to create a captivating book / documentary of the stories from our streets. Web-series of the rides and National Parks and the adventures that I will encounter along the way.